The General Dynamics F-16 Fighting Falcon is a multirole jet fighter aircraft originally developed by General Dynamics for the United States Air Force. Designed as a lightweight, daytime fighter, it evolved into a successful multirole aircraft. Over 4,400 aircraft have been built since production was approved in 1976. Though no longer being purchased by the U.S. Air Force, improved versions are still being built for export customers. In 1993, General Dynamics sold its aircraft manufacturing business to the Lockheed Corporation, which in turn became part of Lockheed Martin after a 1995 merger with Martin Marietta.The Fighting Falcon is a dogfighter with numerous innovations including a frameless bubble canopy for better visibility, side-mounted control stick to ease control while maneuvering, reclined seat to reduce the effect of g-forces on the pilot and the first use of a relaxed static stability/fly-by-wire flight control system that makes it a highly nimble aircraft. The F-16 has an internal M61 Vulcan cannon and has 11 hardpoints for mounting weapons, and other mission equipment. Although the F-16's official name is "Fighting Falcon", it is known to its pilots as the "Viper", due to it resembling a viper snake and after the Battlestar Galactica Colonial Viper starfighter. In addition to USAF active, reserve, and air national guard units, the aircraft is used by the USAF aerial demonstration team, the U.S. Air Force Thunderbirds, and as an adversary/aggressor aircraft by the United States Navy. The F-16 has also been selected to serve in the air forces of 25 other nations.The first Block 50/52 F-16 was delivered in late 1991; the aircraft are equipped with improved GPS/INS, and the aircraft can carry a further batch of advanced missiles: the AGM-88 HARM missile, JDAM, JSOW and WCMD. 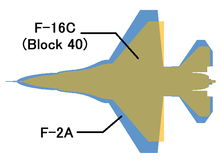 Block 50 aircraft are powered by the F110-GE-129 while the Block 52 jets use the F100-PW-229.This variant, which is also known as the Block 50/52+. Its main differences are the addition of support for conformal fuel tanks (CFTs), a dorsal spine compartment, the APG-68(V9) radar, an On-Board Oxygen Generation (OBOGS) system and a JHMCS helmet.The CFTs are mounted above the wing, on both sides of the fuselage and are easily removable. They provide an additional 440 US gallon or approximately 3,000 pounds (1,400 kg) of additional fuel, allowing increased range or time on station and frees up hardpoints for weapons instead of underwing fuel tanks. All two-seat "Plus" aircraft have the enlarged avionics dorsal spine compartment which is located behind the cockpit and extends to the tail. It adds 30 cu ft (850 L) to the airframe for more avionics with only small increases in weight and drag.Poland took delivery of its first F-16C Block 52+ aircraft on 15 September 2006. The "Poland Peace Sky program" includes 36 F-16Cs and 12 F-16Ds. All 48 aircraft were delivered in 2008.The Hellenic Air Force took delivery of its first F-16C Block 52+ aircraft on 22 May 2008. The total Greek order is for 20 F-16Cs and 10 F-16Ds. The remaining 26 aircraft should be delivered by March 2010. Pakistan Air Force has order 18 F-16C/D Block 52+ which include 10 F-16C and 8 F-16D. The Israeli F-16I is based on the block 52+ aircraft. Mitsubishi F-2 (MHI) - Japan. General Electric (engine), Kawasaki, Honeywell, Raytheon, NEC, Hazeltine, and Kokusai Electric are among the other larger participants to varying degrees. Lockheed Martin supplies the aft fuselage, leading edge slats, stores management system, a large portion of wing boxes, and other components. Kawasaki builds the midsection of the fuselage, as well as the doors to the main wheel and the engine, while forward fuselage and wings are built by Mitsubishi. Avionics are supplied by Lockheed Martin, and the digital fly-by-wire system has been jointly developed by Japan Aviation Electric and Honeywell (formerly Allied Signal). Contractors for communication systems and IFF interrogators include Raytheon, NEC, Hazeltine, and Kokusai Electric. Final assembly is done in Japan, by MHI at its Komaki-South facility in Nagoya.The F-2 has three display screens, including a liquid crystal display from Yokogawa.